“We made solid progress again in the first quarter as all sectors contributed to the 31% improvement of our operational results, clearly demonstrating the positive impact our Accelerate! transformation program is having on our company. The initiatives to improve gross margins, structurally lower our cost base and reduce our inventory levels led to a better performance in the quarter. Consumer Lifestyle sales did very well, with strong 10% growth, as our locally relevant products and granular approach to drive growth delivered results. At Lighting, LED-based sales grew 38% over the previous year. Weak construction markets negatively impacted overall Lighting sales which were flat compared to the first quarter of 2012. At Healthcare, lower order intake in 2012 impacted sales, mainly in the US. Q1 financials: Operating results improve to 8.0% of sales versus 6.1% in Q1 2012, with improvements across all sectors. Sales growth in the quarter was modest. Healthcare comparable sales declined by 1% year-on-year. Customer Services and Home Healthcare Solutions had low single-digit growth, Patient Care & Clinical Informatics sales were flat, and Imaging Systems sales had a high-single-digit decline. Currency-comparable equipment order intake declined by 5%. EBITA margin improved to 10.4% of sales. EBITA margin excluding restructuring and other charges was 10.5% of sales, a year-on-year improvement of 0.9 percentage points. Consumer Lifestyle comparable sales were 10% higher year-on-year, driven by double-digit growth at Domestic Appliances, high-single-digit growth at Personal Care, and mid-single-digit growth at Health & Wellness. EBITA margin was 9.8%. EBITA margin excluding restructuring and other charges was 9.9% of sales, a year-on-year improvement of 3.2 percentage points. Lighting comparable sales were in line with Q1 2012 as double-digit growth at Lumileds and mid-single-digit growth at Automotive were offset by declines in the other businesses. LED-based sales grew 38% compared to Q1 2012 and now represent 23% of Lighting sales. EBITA margin improved to 7.4%. EBITA margin excluding restructuring and other charges was 8.4%, an improvement of 3.7 percentage points. Philips has completed 86% of the EUR 2 billion share buy-back program since the start of the program in July 2011. Prior-period financials have been revised for the adoption of IAS19R, which mainly relates to pension reporting. Our multi-year change and performance improvement program, Accelerate!, is now nearing its 2nd anniversary and has delivered solid results. The Accelerate! program will run through 2017 and has five comprehensive streams to enhance customer relevance, change the company culture, reduce overhead costs, streamline our end-to-end customer value chains, and re-allocate resources to profitable growth opportunities. To support this transformation, over 900 senior leaders have participated in change management programs to create a high-performance culture. Our quarterly surveys conducted across 40,000 employees confirm that our Accelerate! initiatives are impacting all levels of the organization. We have launched our DfX program (DfX stands for Design for X, where X can be cost, quality, manufacturing, etc.) to reduce our bill of materials and improve value creation. The first pilots of our DfX program have clearly demonstrated the potential for improvement in this area. We have simplified the value chain in executed projects, which has led to an improvement of around 25% in customer service levels in Q1 2013 and reduced time-to-market of new innovations. Our overhead cost reduction program has resulted in EUR 549 million cumulative gross savings to date, including EUR 78 million realized in Q1 2013. We reduced inventory levels by 1.4 percentage points year-on-year this quarter. Expanding its leadership in image-guided interventions and therapy, Philips has globally introduced its EchoNavigator live image-guidance tool, a world-first technology that combines live X-ray and 3D ultrasound to support structural heart-disease repairs without the need for open-heart surgery. Investing in growth geographies such as Africa, Philips launched the “Fabric of Africa”, a collaborative campaign to improve healthcare access across the continent. Philips will introduce innovative, cost appropriate health technologies and solutions to the African market, and through local and international partnerships will provide financing solutions, technical assistance and support, and training programs. Driving growth in its Oral Healthcare business, Philips launched its latest sonic toothbrush at the world’s largest dental show. Designed to provide a deeper clean between teeth, the Sonicare FlexCare Platinum features a pressure sensor for an optimum brushing technique. 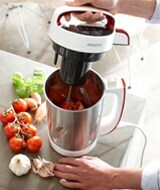 Following a successful launch in France, Philips introduced its SoupMaker to markets across Europe and the Middle East. 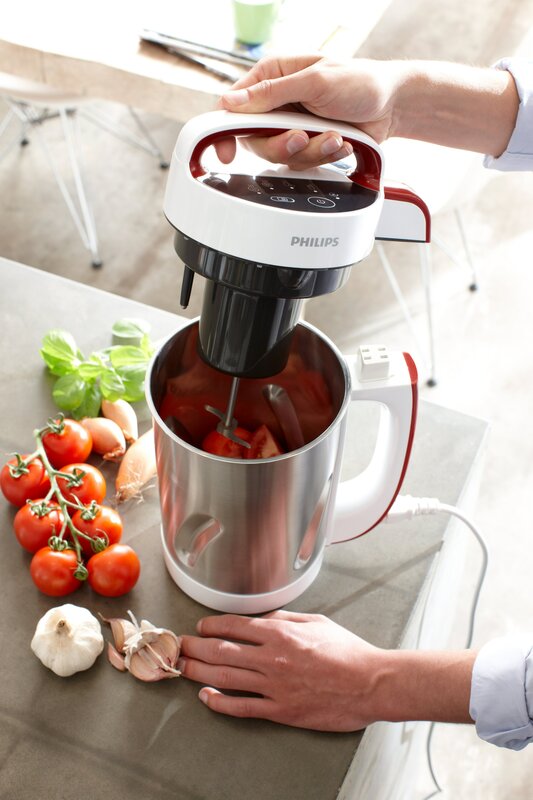 Leveraging its global innovation power and local-for-local capabilities, the kitchen appliance is based on the same platform as Philips’ soy milk makers, which were first developed in China for the Chinese market. 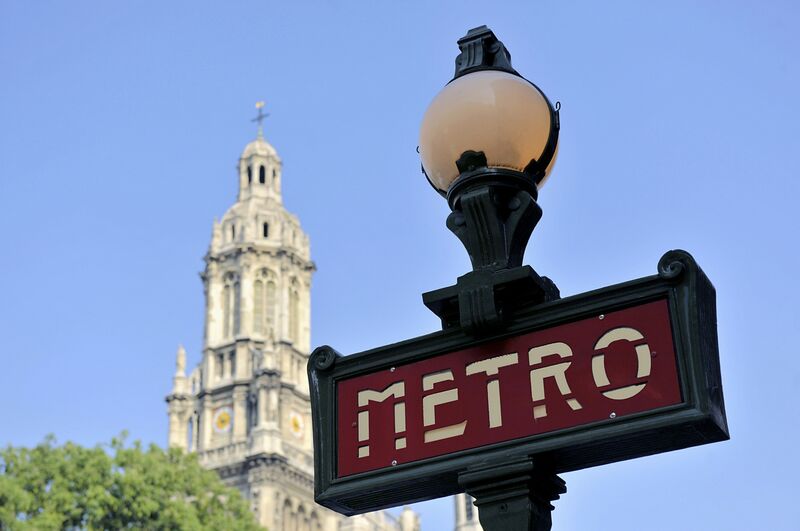 Leveraging its expertise in LED lighting solutions, Philips has won a multi-year contract to switch the majority of the lighting in Paris’ metro and RER stations to LED. This will improve the quality of the light while halving the energy usage. 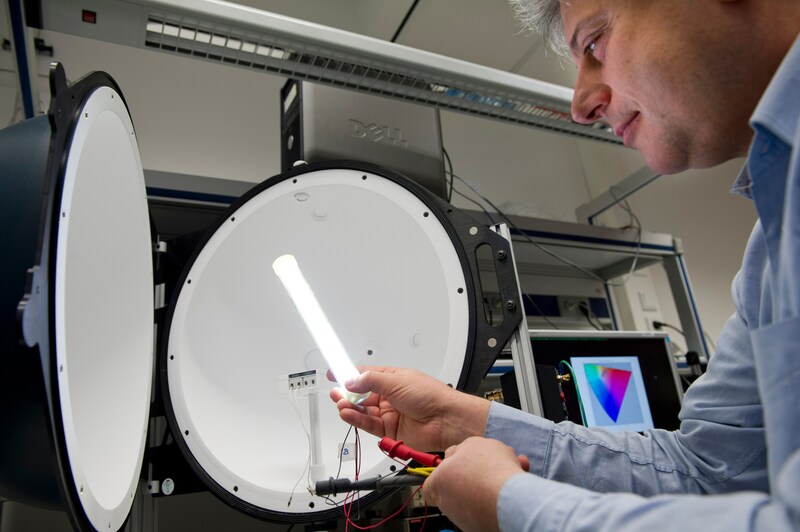 Reinforcing its LED technology leadership, Philips’ researchers have developed the world’s most energy efficient LED lamp suitable for general lighting applications. The tube lighting (TL) replacement TLED prototype produces a record 200 lumens per watt (lm/W) of high-quality white light compared with 100 lm/W for fluorescent lighting. This document and the related oral presentation, including responses to questions following the presentation, contain certain forward-looking statements with respect to the financial condition, results of operations and business of Philips and certain of the plans and objectives of Philips with respect to these items. Examples of forward-looking statements include statements made about our strategy, estimates of sales growth, future EBITA and future developments in our organic business. By their nature, these statements involve risk and uncertainty because they relate to future events and circumstances and there are many factors that could cause actual results and developments to differ materially from those expressed or implied by these statements. In presenting and discussing the Philips Group’s financial position, operating results and cash flows, management uses certain non-GAAP financial measures. These non-GAAP financial measures should not be viewed in isolation as alternatives to the equivalent IFRS measures and should be used in conjunction with the most directly comparable IFRS measures. A reconciliation of such measures to the most directly comparable IFRS measures is contained in this document. Further information on non-GAAP measures can be found in our Annual Report 2012. In presenting the Philips Group’s financial position, fair values are used for the measurement of various items in accordance with the applicable accounting standards. These fair values are based on market prices, where available, and are obtained from sources that are deemed to be reliable. Readers are cautioned that these values are subject to changes over time and are only valid at the balance sheet date. When quoted prices do not exist, we estimated the fair values using appropriate valuation models, and when observable market data are not available, we used unobservable inputs. They require management to make significant assumptions with respect to future developments, which are inherently uncertain and may therefore deviate from actual developments. Critical assumptions used are disclosed in our 2012 financial statements. Independent valuations may have been obtained to support management’s determination of fair values. All amounts in millions of euros unless otherwise stated; data included are unaudited. Financial reporting is in accordance with IFRS, unless otherwise stated. Prior-period financials have been revised for the treatment of Audio, Video, Multimedia and Accessories as discontinued operations, the adoption of IAS19R, which mainly relates to pension reporting, and adjustments to the quarterly figures of 2012, which have already been included in the Annual Report 2012 (for an explanation we refer to Annual Report section 12.10 “Significant Accounting Policies”). An overview of the revised 2012 figures per quarter will become available on the Philips website in the Investor Relations section.